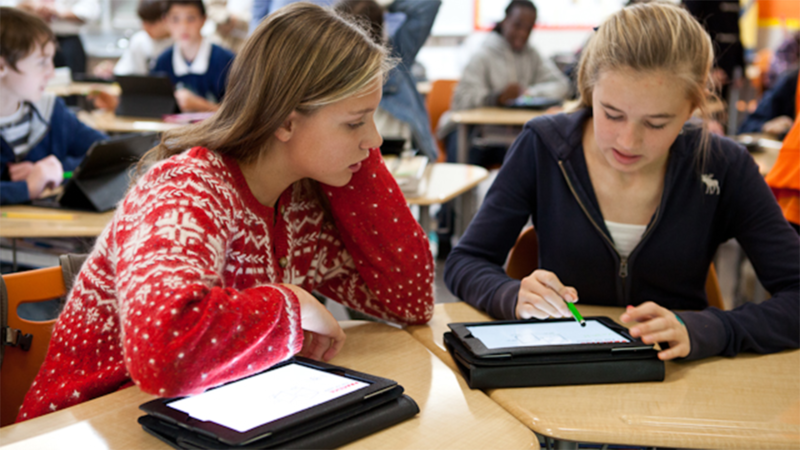 Students are doing more reading on digital devices than they ever have before. Not only are many teachers using tablets and computers for classroom instruction, but many state tests are now administered on computers, adding incentive for teachers to teach digital reading strategies. But casual digital reading on the internet has instilled bad habits in many students, making it difficult for them to engage deeply with digital text in the same way they do when reading materials printed on paper. “I don’t believe technology should ever be taught separately,” Hess said. Most of what he helps teachers learn are plain old good reading strategies, but he tries to highlight how practicing them in the digital space can make feedback easier and help students go further in their thinking. “The world is almost forcing us to go there,” Hess said. He sees deep digital reading as a new kind of literacy and a crucial one for the academic environment, as well as for students who will grow up to be adult citizens interacting with digital text as they move through their daily lives. Many of his strategies resonate with teachers because they are based in research about how students have always made sense of difficult texts and are only enhanced by a few digital affordances. “I’m sure you’ve had the experience of thinking about a problem and then you talk to someone else,” Hess said. “Just the nature of conversation impacts your comprehension.” Discourse is at the center of the strategies he teaches, which is why he’s not a fan of one-to-one programs that isolate kids on individual computers practicing rote skills through software. To him, that usage of technology doesn’t capitalize on the powerful learning that happens in social, collaborative spaces. “There is that danger of silencing that discourse, to the degree that teachers were using it anyway,” Hess said. He acknowledges that too few teachers know how to effectively facilitate academic discussions in classrooms, and that often “turn and talk to a partner” devolves into “turn and gossip.” But those issues have always existed in classrooms and aren’t the fault of technology. In fact, Hess maintains that to be a good teacher who uses technology, a person must first be a good teacher. Technology won’t repair those gaps. Reading print media is undeniably different from reading digital content. Researchers have been trying to understand how and why people interact differently with the two media and have shown that when students read online they comprehend less. But there isn’t enough longitudinal data to know if those deficits can be remediated by learning strategies specific to digital content. Those who prefer reading in print talk about the ability to flip pages, write in the margins and that they remember a scene based on where it was located on the page. It’s more of a linear experience and readers interact with it in specific ways. In contrast, digital reading takes place on a flat screen and the ability to hyperlink to related content makes the experience feel more like stream of consciousness than like a linear reading experience. It takes more self-control to stay focused when reading digitally, a challenge for many students used to quickly navigating around the Web. “It’s an amazing thing, but it also causes a lot of fragmentation,” Hess said. The key to getting kids to read deeply in any format is to have them engage with the text in meaningful ways. In the digital space, that means disrupting a pattern of skipping around, writing short chats and getting lost down the rabbit hole of the internet. It means teaching kids ways to break down a complex text, find key ideas, organize them and defend them. Practicing those skills in class can be time-consuming, but it also builds good digital reading habits that hopefully become second nature. “The goal in almost all the strategies is to slow the kids down so they are focusing on this text,” Hess said. “Number two is to engage them in an active way with the text, and number three you want to encourage oral discourse. And number four you want them to do some reflection.” Those steps should sound familiar to teachers because they are important for any kind of reading for comprehension and analysis. The trick for teachers is to learn how to transfer these processes into the digital space and push them even further. Most of Hess’ tricks are easy to do in Google Docs, a free tool many schools are adopting because it’s easy for students to access their work anywhere. In this strategy, students have an excerpt of a difficult article open in Google Docs. First, the teacher asks students to read through on their own and highlight words they don’t know. This is basic decoding work. After everyone is on the same page with the vocabulary, teachers can ask pairs of students to read a paragraph together and highlight key ideas. As they do this, they’ll have to discuss why they believe those parts are important. After they have a few minutes to do this activity, the teacher can ask them to individually devise a four-word heading for that portion of the text based on the main ideas they’ve highlighted. They can type their heading into the Google Doc and then compare the headings each created. “If you came up with something different, you have to now justify why yours is better,” Hess said. Once again, students have to defend their thinking using text. “Making that heading has forced us to dig into the text,” Hess said. The teacher can then ask for all the agreed-upon headings and pair different groups together so that four students have to discuss their headings and come to consensus on the single best representation of the main ideas. “When you walk around and listen, what the kids are talking about is the text,” Hess said. At the end, the teacher might have groups present or even have the whole class vote on their favorite heading. And individually students can reflect on the process they went through, how the heading helps them understand the reading, and how it helps them answer the driving question of the unit. Hess is the first to admit that this strategy could easily be done with paper and pencil. The only real affordance of the technology is the ability to change the heading multiple times in a clean way. But it does help teachers see how to bring dialogue and discussion into the classroom, even when students are reading on the computer, and it has achieved the goal of slowing down reading. When students practice this method they may internalize it as well and start looking for the main idea in each paragraph as they read. “Part of it is getting kids to be thinking about why they are reading something,” Hess said. Often kids will read an entire paragraph, understand all the words in it, but never slow down to make meaning or look for main ideas. This basic reading strategy forces them to do so. Once students can identify the main idea of a reading, the next task is to understand the flow of the ideas and to connect concepts. Meanwhile, along the side of the Google Doc an outline will automatically populate with main ideas in Heading 1 and supporting evidence nested below in Heading 2. At the end, the whole essay is outlined and can be “exported to table of contents,” which will put it at the top of the document, where it can be used as a jumping-off point for writing. The technology didn’t do any of the thinking for students, but in this case the software helped build an outline as students discuss and winnow down their evidence, and their work has been conveniently saved in an easy-to-review manner. That makes initiating writing -- often hard for students -- much easier. And the headings in the outline are links that automatically skip to the part of the text where students inserted that heading. “You’ve created an active document,” Hess said. Even better in Hess’ mind, when a teacher sees an outline like this he or she can easily tell if the student understood the reading. To create the outline students have to comprehend the text; decoding isn’t enough. Hess says he uses this strategy all the time when reading documents for his own work because it’s useful, not just a tedious exercise to force kids to slow down. If a school or teacher isn’t using Google Docs, a similar type of “talking to the text” can be achieved using Diigo, which also allows users to share marked-up documents with one another that include comments or highlights. Students have been highlighting print texts for a long time, but anyone who has picked up an old copy of a high school text knows that sometimes the various highlights can get confusing. Teachers sometimes try to organize students by having them highlight different concepts in different colors, but the text can end up quite messy and hard to read after all that highlighting. Hess worked with a student to improve on a “highlighter tool,” Google Doc add-on that the student created in his computer science class. The tool lets users create individualized highlighters in different colors. So, for example, all the text that supports “Argument #1” might be in red, while the evidence in “Argument #2” might be in green, and so on. The highlights can be exported by color, which creates a table with all the ideas. Hess often suggests that students then add another column to the highlighter table, where they can write summaries of everything in that highlighted category. “It helps them discern between different things, and secondly, you’ve asked them to summarize what they’ve done,” Hess said. That provides good reflection and consolidation of the information they just picked out. Since some kids have difficulty prioritizing what to highlight, a teacher could limit the number of items for each color. In this case, the highlighting strategy is made much easier and more effective because it is digital. The various colors are labeled so the student doesn’t need a key to decipher highlights and all the information can be exported in one table, rather than having to sift back through the entire article. Hess warns that many of these strategies should first be taught using a text that isn’t a difficult cognitive lift for students so they can learn the reading strategy and the digital tools without also having to puzzle their way through a difficult text. A new tech tool and a new learning challenge at the same time are a recipe for frustration. While these strategies take time, they also get students deeply engaged with texts that may be difficult for them. Digital tools that modify articles for different reading levels, like Newsela, have a time and a place -- like getting students on the same page about a topic so they can debate -- but there are drawbacks to offering students only texts at their level. “If you are constantly bringing it down, you lose some of the richness,” Hess said. And challenging texts that force students to struggle also help them grow. “You can have someone reading a very complex text if you can scaffold it,” Hess said. Evelyn Cervantes is an eighth-grade social studies teacher at Bret Harte Middle School in San Jose, California. Although located in the heart of Silicon Valley, the school only has a few laptop carts that all the teachers share. Cervantes knows many of her students are online at home a lot and she wants to make sure the lower-income students the school also serves are learning good digital skills when at school. In the past she experimented with showing videos in class and using a polling app, but wasn’t very impressed with how those tools impacted learning for her students. “I felt like it was very much about giving information to the kids, so more delivery of information, and not much beyond that,” Cervantes said. She has been pushing herself to use some of the strategies Hess taught her and likes the way they require students to engage deeply with text. She’s tired of students copying and pasting text without doing any analysis. “The strategies make it so that students have to slow down and analyze what they’re reading,” Cervantes said. She also noticed that when kids had their own computers they often didn’t really engage in dialogue when they were asked to share with a partner. Instead, they would merely share their screens. In response she halved the number of computers in the room, so pairs of students would have to share. After that modification she started to see much more robust dialogue. Cervantes says although many of the strategies Hess taught her could be done on paper, she likes using Google Docs because the outlines and annotations students create during class can easily become their notes. She can review them and return them quickly, touching on common themes or helping to point out holes in the thinking of the class. Hess emphasizes that all these digital reading tools must be used within the context of bigger, interesting questions, or else the strategies just become a list of steps. While Socratic seminars can take a lot of preparation, students are identifying main ideas, categorizing evidence and highlighting important passages in the service of an argument that they care about, which makes the whole process more meaningful. A New Yorker article dedicated to the question of whether students read as deeply on digital devices as in print focuses on the work of Maryanne Wolf, as well as others studying the space. Several studies found the decrease in comprehension on digital devices was more due to distractions on the internet than to the medium itself. Perhaps self-control is among the key skills to teach students expected to read more online. "Wolf is optimistic that we can learn to navigate online reading just as deeply as we once did print—if we go about it with the necessary thoughtfulness. In a new study, the introduction of an interactive annotation component helped improve comprehension and reading strategy use in a group of fifth graders. It turns out that they could read deeply. They just had to be taught how." *This article has been updated to clarify that many of these strategies were first developed as paper-based strategies by the UC Berkeley History-Social Science Project.